Earlier this year, on the wrecked forecourt of the now defunct Pre-Fabricated House Factory in Warsaw, a new building sprung up. It was a classic modular construction, typical of the utopian 60s or 70s: tall and erect, if a little shorter than the average tower block. Within weeks, just when it looked like its steel frame might be clad in the concrete that cloaks many Polish cities like a dusty grey mantle, it had disappeared again. In a city that has long cannibalised its old material self to survive; whose historic centre is a post-war fake; where grim housing projects are perhaps its true architectural heritage; and where communist era buildings are now routinely stripped back to the bone and dressed in more ‘progressive’ outfits, rumours swirled around the neighbourhood about the vanishing building. Perhaps the developers had fallen out with each other. Maybe the construction was faulty. In fact, the construction—a work entitled ‘1:1’ by Monika Sosnowska—was being expertly squeezed in vices, twisted and torqued by engineers and skilled workers, and then sliced up and reassembled, awkwardly shoe-horned into a neo-classical pavilion in Venice. Sosnowska’s ‘1:1’ has turned out to be one of the key events of this year’s Venice Biennale. A building inside a building, the blackened steel structure shrugging off, but unable to quite shake, the white pavilion that contains it. ‘1:1’ is an unsettling, unresolved confrontation between a handful of versions of Polish identity: the aspiration of pre-war cultural ambition represented by the pavilion itself, the ‘People’s Poland’, of housing shortages and modular pre-fabs and the shiny happy future of globalised glamour and EU economics. At the same time, despite the weight of all that history, the internal and external pressures that inevitably accompany the invitation to represent your country at Venice, ‘1:1’ stands out as an incredibly precise piece of formal sculpture. With a sinuous, almost feminine, rhythm set against the clunky nationalisms of the Giardini, it is curiously expressive: a crumpled defiance of restraint, a bravura performance as a sly protest against the requirement to perform. For Sosnowska, born in Ryki, Poland in 1972, the commission was her largest completed to date, and is typically ambitious. ‘I can’t face repeating myself,’ she says. ‘But when I prepare something new I don’t feel the effort’. The effort of creating ‘1:1’ was akin to directing a film, with its team of experts and construction workers, its awkward set, and high pressure premiere. Yet at the heart of Sosnowska’s practice is something more intimate and hands-on. Her works rely on model-making in the studio, not as a technical rehearsal, but as a form of immediate visual thinking. ‘The models are simply done,’ she explains. ‘Sometimes it takes just a few minutes. The energy is there, a simplicity, but also something very strong’. This autumn, at Edinburgh’s Talbot Rice Gallery, Sosnowska will show the most complete set yet of the models that form the core of her practice, from ‘1:1’, back to a little-known student work made at the Rijksacademie at the turn of the decade. Crafted from basic materials such as paper, wire, cardboard, paints and old boxes, they create a Lilliputian world set on pristine plinths. 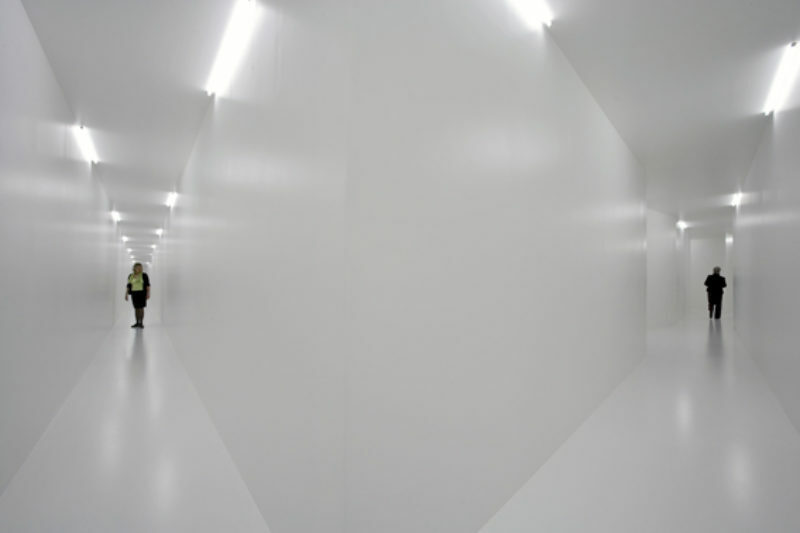 Among them will be ‘Corridor’, the shrinking and disorientating passageway made for the exhibition Clandestine at the 50th Venice Biennale in 2003; the dull pink maze of her installation at de Appel, Amsterdam in 2004; the confusing brown labyrinth of her untitled exhibition at the Serpentine Gallery in London the same year, and the frightening ‘fake within a fake’ maze ‘M10’, a sequence of rooms shown at Glasgow International, 2005. Sosnowska has reached international prominence for this series of complex sculptural environments which are most usually in a gallery or made as site-specific works. Her materials are usually familiar and readily available and include domestic flooring, MDF and household or industrial paints. Her work often makes reference to particular moments in architecture or interior history but her strategies depend on subverting or transforming these materials into experiences which have an immediate sensory impact through strategies such as spatial disorientation, repetition or absurdity. Her characteristic form has been that of the labyrinthine or enclosed installation where the viewer finds themselves within the art work, walking or crawling until they can go no further, opening successive doors until they reach a surprise dead end or wrong-footed by meticulous fragmentation of light and space. But her work also deliberately holds back from full on spectacle. 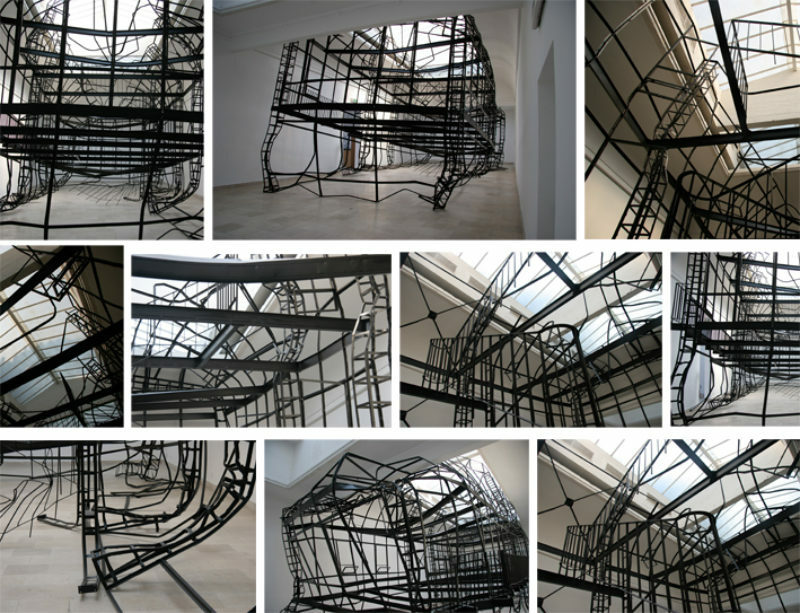 She uses what she has described as ‘non-materials’ and evokes powerful yet somehow blank non-spaces. 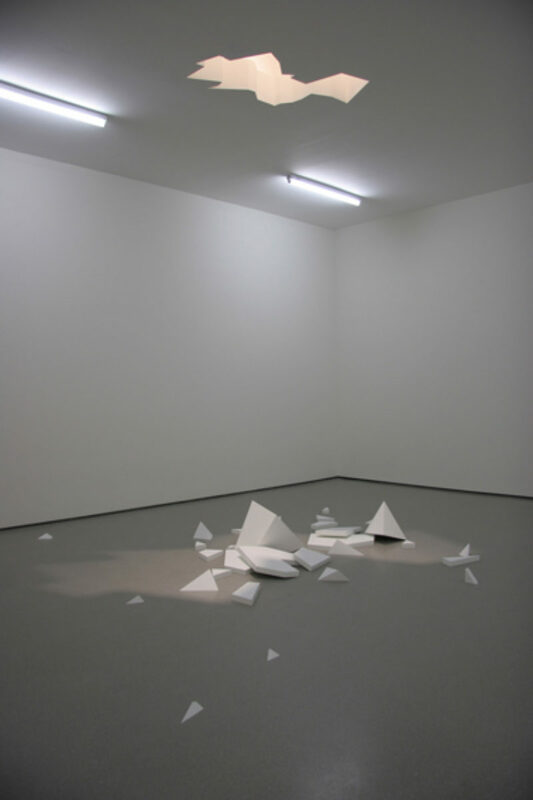 In New York, last year, sanguine in the face of an invitation to show at the Museum of Modern Art, Sosnowska sculpted a hole in the ceiling and styled shattered debris below. At Kiasma in Helsinki it was a leaky patch and a water stain. An as yet unrealised commission for the Gorbals area of Glasgow proposes an extensive ruined wall as an unsettling boundary between private and public space in an area of showpiece regeneration—unidealised banality of urban space and the everyday reality of the depleted fabric of some Eastern European cities. In Edinburgh, as well as a sculptural installation of the models, she will make a subtle intervention in the building itself. ‘I’m not telling a story or creating a narrative, it is something far more intuitive than that.’ Typically, she is drawn to the layers of history reflected in the galleries where the white cube has been built into the original structure, the Georgian splendour somewhat tempered by the intervening years. Visiting Sosnowska in Warsaw, a couple of years ago, I asked her to recommend a few sights. She sent me to the Museum of Technology, a dusty sequence of rooms in the city’s Stalinist tower block the Palace of Culture, where pimply adolescents learn about forestry or iron smelting technology; where the computer is celebrated by a static display of dead plastic and where a triumphant model of the Sputnik satellite is rather pathetically dented. Undoubtedly, there is a doll’s house quality to Sosnowska’s models, suggests Pat Fisher, curator at Talbot Rice Gallery, ‘There’s something fanciful about being able to be the god and look down on this world.’ In Sosnowska’s art such acts of imagination are not an indulgence but an imperative. The pleasures of play mingled with deliberate incongruity are key to the defiance of official narratives in a work like ‘1:1’. ‘I think there must be a balance between what is happening with your head and what is happening with the material world.’ The models articulate precisely this equilibrium. ’More and more I think the models are the total work,’ says Sosnowska today. ‘They compose one single sculpture, this is a single landscape, a single city.’ If that is the case then Sosnowska’s city is one of dead ends and false starts. It is a place where failure is itself a kind of success, not just because of that familiar melancholy refrain, the romance of ruins, but because of a far steelier refusal to invest in other people’s fixed ideas. Sosnowska’s work is a lesson in the essential instability of things. A crushed ball of paper or a reclaimed sheet of cardboard has as much substance and far more energy than steel or concrete, bricks or mortar. After all, Sosnoswka’s home city is a place where whole buildings can simply appear, or disappear, overnight.